Designed by A.O. 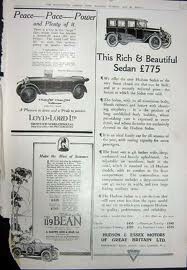 Lord who was responsible for the engine of the Albert, in partnership with Mr Loyd, later associated with Carden-Loyd tracked military vehicles, the Loyd-Lord started out as a conventional car with 1795 or 2120cc 4-cylinder ohv Meadows engines, Meadows 4-speed gearboxes and a substantial tourer body. With the smaller engine it was the 12/30hp, with the larger, the 14/30 or 14/40hp. After 38 cars had been made, Lord turned to the 2-stroke engine, building his own designs of air-cooled engines with separately-cast cylinders of 1082cc 2-cylinder (11hp) or 2009cc 4-cylinder (18/60hp). They were supercharged by rotary blowers. They still used Meadows gearboxes, of 3-or 4-speeds, and the 18/60 had front-wheel brakes, but the unconventional engines scared buyers away, and very few of the 2-strokes were made.